Internet has become a very useful tool for many different purposes. I clearly remember that De La Salle University (Manila) only had the internet connection in 1996. I was in third year college then and it amazed me how we can write "letters" and receive them in real time. People have become so hooked to email and internet and try to discover what the world has to offer. Telnet, the old term for chats, has taken all the computer laboratories by storm (or even by a hurricane!). My initial reaction to this internet phenomena was: How does that thing happen? Students cut classes and skipped meals, just to spend time online and try meeting new friends online within the school, outside Metro Manila and getting to know people across the globe. You'd hear the buzz of the keyboards in computer labs nonstop (take note: all seats taken till 9pm closing time)! For over a decade now, blogging has played a great significant role in social media, marketing and business. Internet marketing gurus from different countries are gathered to share their expertise in The Asia Internet Congress to be held at the Crowne Plaza Galleria in Manila, Philippines, on March 4-5, 2010. With the theme, "Internet Marketing: A Click to Business Profit," people from the social media, business and marketing will surely gain a lot from this event. Who would have thought that email can be instrumental in generating loads of money? I'd like also to know their secrets on how they turn things online into dazzling, shimmering and splendid cash. 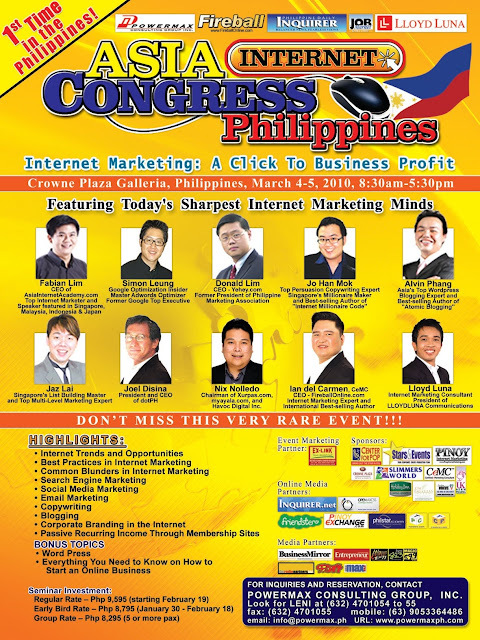 Learn from the internet marketing experts like: Alvin Phang, Fabian Lim, Jo Han Mok and Jaz Lai (Singapore), Simon Leung (Hong Kong), Donald Lim, Ian del Carmen, Lloyd Luna, Nix Nolledo and Joel Disina (Philippines). This is an interesting event. I am considering going to this. I like to express my opinion and warn the fellow filipinos about this group so called internet gurus who has being going around the world making seminars, courses by selling packages and so call internet marketing secrets courses and other investments. Most of the people who attended the seminar paid up for the courses felt short change, disappointed, confused and cheated for what they have promised in the seminars and ended up have to continue other packages or courses and in the end, ended nothing or have to be associate with them by sell the products. Others paid a big lump sum amount for an promised or event guarantee business investment package and ended up with websites products which doesn't sell or even nothing that works which are useless. For your information, the tricks they used here is that all the victims have no contracts and proof of the things that they promised and sold to them. So most of them can’t do much and just felt cheated and unlucky. Like this Singaporean guru, Jo Han Mok was staying in the states for some years and claims to make over 12 millions of dollars and this is people who paid ads in google ad telling the world how this Jo Han Mok scam him. Well, they told you that they are millionaires? Maybe make couple of bucks from internet but most of their wealth came from the victims who paid them so much money and ended up learning nothing of good value and others worst. I hope the Filipino will use their wisdom and will not be the next victims again. A good post on The Intersections & Beyond. We are VA4World a virtual assistant firm who provide admin support service for SME’s all over the world. We would like to hear your feedback.